Masking with random values is an effective countermeasure against side-channel attacks. For cryptographic algorithms combining arithmetic and Boolean masking, it is necessary to switch from arithmetic to Boolean masking and vice versa. 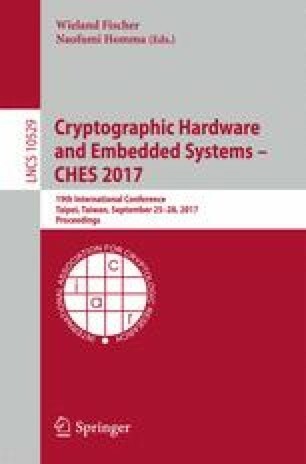 Following a recent approach by Hutter and Tunstall, we describe a high-order Boolean to arithmetic conversion algorithm whose complexity is independent of the register size k. Our new algorithm is proven secure in the Ishai, Sahai and Wagner (ISW) framework for private circuits. In practice, for small orders, our new countermeasure is one order of magnitude faster than previous work. We also describe a 3rd-order attack against the 3rd-order Hutter-Tunstall algorithm, and a constant, 4th-order attack against the t-th order Hutter-Tunstall algorithms, for any \(t \ge 4\).